Arizona Federal Credit Union checking account vs other banks and credit unions. Dont let AZFCU rip you off! | Arizona Federal Credit Union has a new $3 Monthly Membership Fee! Greedy fatcat managers are forcing members to pay a mandatory $3 ripoff fee every month, simply for being a member. That's not mutually beneficial. ← Arizona Federal Credit Union must reverse course to cancel the $3 monthly membership fee and refund those fees already charged to current and past members. Arizona Federal Credit Union’s website lists an incomplete and misleading checking comparison chart. We will show you a more fair comparison chart. Click image to enlarge for easier reading. Arizona Federal Credit Union has some of the highest, most excessive outrageous fees. Click image to enlarge for easier reading. 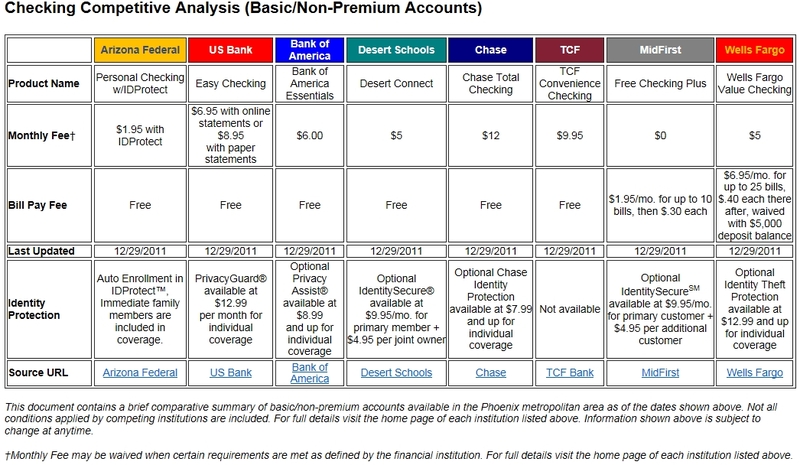 As of May 2013, AZFCU still has a website page from 2011 comparing their checking account vs banks. Since AZFCU believes in financial education, why are they not truly educating their members by also listing competing credit unions? Notice how they mention their $1.95 IDProtect fee that was optional for checking account holders in 2012? Then when they launched their unavoidable $3 monthly weasel fee in January 2013, they claimed it was suddenly worth $15. We will do the work for Arizona Federal Credit Union, by educating people to show them there are MANY choices for free checking. These choices have NO FEES for checking, NO FEES for a debit card, and NO FEES for being a member or customer. If you stay with Arizona Federal Credit Union, you should express your outrage to have this unjust fee rescinded. If you choose to leave Arizona Federal Credit Union, we will educate you on some good alternatives! Additionally, AZFCU’s website as of May 2013, claimed they had “no such plans” in 2011 to charge for a debit card while knocking the banks for same, yet the fee schedule in May 2013 shows a $3 monthly fee for an ATM Cash Card. At Arizona Federal, there are no such plans (to charge a monthly debit card fee). Rather, we encourage members to use their debit cards for all of their purchases, with no fear of being assessed a debit card fee. We recently even rewarded one of our members with a free trip to Disneyland as the result of a drawing that included everyone who had made a certain type of purchase with an Arizona Federal debit card in the previous six weeks. Use their card, pay a fee; use ours, go to the Happiest Place on Earth! This spreadsheet will show you financial institutions that offer totally free checking. Some have requirements to meet in order for checking to be free, such as direct deposit, minimum balances, or estatements. ACH Collection Fee $5 per ACH origination A fee is charged when an ACH transaction is originated for a loan or share account payment. ATM Cash Card Fee $3 per month Waived for members under 18 years old or over 50. ATM Deposit Adjustment Fee $10 per item Fee applied per non-negotiable item. $35 per item Fee applied per item if altered or envelope is empty. ATM Fee (Foreign Usage) $2 per transaction over four per month No fee is charged for using Arizona Federal issued cards at an ATM owned by us. At non-Arizona Federal owned ATMs, the fee is $2 per transaction over four (4) per month. Other institutions may assess a fee when you use their ATM. Cashier’s Check Fee $3 per check Fee charged to Arizona Federal members. Check Printing Charge Varies Cost will vary based on check selection. Coin Processing Fee – Member 4.9% The Coinstar machine automatically deducts the 4.9% fee — or you can choose to turn your coins into an e-certificate and eliminate the fee. Deposits made into DollarDot accounts are exempt from the fee. Collection Item $5 per item For items that require special handling. Convenience Payment $18 per transaction Fee for loan payments made from a third party credit card. Counter Checks $2 Fee for four (4) encoded temporary checks. Document Copy Fee $2 per item $2 per item copied, including checks, statements and the printing of forms available through self service options. Research Fee applies for items greater than two years old. An Offsite Delivery Fee of $3 per box applies to any item that must be retrieved from storage. Duplicate Title Fee $25 Fee for duplicate title. Escheat Administration Fee $50 Fee for remitting unclaimed property to the State of Arizona. in a month Savings, sub-shares or money market: $6 per transfer after six pre-authorized electronic funds transfers made in a month. These transfers included overdraft protection transfers from savings, ACH debits, telephonic transfers, CU Online, Touch Tone 24, and automatic transfer from savings to deposit accounts. This fee is assessed at the end of the month. Inactive Account Fee $5 per month $5 per month if account balance is less than $1000 and no owner intiated financial transactions in the last 6 months. Posted by the 15th of each month. Waived if the member is under 18. Incoming Wire Fee $9 Assessed for every wire over $100 received and posted to an account. IRS taxes may apply; consult a tax advisor. Legal Process Fee $100 per request Fee to process a garnishment or levy. Locator Fee $5 per notification Fee to update mailing address from postal service. Membership Dues $3 per month Effective 1/1/2013, $3 per month, waived for members under age 18 and for Representative Payee accounts. Membership Restoration $25 Effective 1/1/2013, $25 for former members to rejoin the Arizona Federal cooperative. Must meet membership eligibility and opening balance requirements. Missing Documentation Fee $50 Charged for any instance of failing to provide requested documentation related to missing/invalid Tax Identification Numbers, proof of foreign status, or Certificate of Death. Multi-Currency International Service Assessment Fee (Currency Conversion Fee) Up to 3% of the transaction amount Fee for conversion of debit and credit card transactions into a United States dollar amount. Overdraft Fee $35 per transaction $35.00 per transaction that draws an account negative or $35.00 for each item that is paid under the Overdraft Courtesy program when funds are not available to cover drafts, ACH debits, preauthorized drafts, or everyday debit card transactions. This overdraft courtesy service is discretionary as defined in the Accounts and Services Membership Agreement. Outgoing Wire $18 Domestic wires. Paper Statement Service $2 per deposit account Effective 1/1/2013, cost of paper statement is $2 per deposit account. Priority Mail $12 Two day delivery. Research Fee $20 per hour One-hour minimum. Returned Deposited Item Fee $10 each (per occurrence) Charged for each occurrence of a deposit item being returned. $35 each (per occurrence) Charged for each occurrence of a deposit item returned on the member’s account at another institution. Returned Draft Fee $35 per item (per occurrence) Fee applied per transaction for all checks, ACH debits, pre-authorized items, Visa Check Card or ATM transactions presented against accounts with an insufficient available balance. Insufficient available balances include Non-sufficient funds (NSF) and Uncollected Funds (UCF). Visa Payments $25 Maximum Returned item fees for consumer credit card payments are now equal to the payment amount up to a maximum of $25.00. Rush Scanned Title $35 Fee for overnight delivery of a scanned title. Safe Deposit Box – Drilling Fee $200 If both keys are missing when box is surrendered. Safe Deposit Box – Late Fee $10 Late fee will be assessed at the time of payment if the rental payment is 30 days or more past due. Safe Deposit Box – Missing Key $25 Key fee if one key is missing when box is surrendered. Single-Currency International Service Assessment Fee (Cross-Border Transaction Fee) Up to 3% of the transaction amount Processing fee for debit and credit card transactions initiated and/or settled across different country borders. Stop Payment Fee $35 per item Non-refundable. Title Modification Fee $12 Fee to modify ownership, name or state. Additional fees may apply for business accounts or requests by third parties. Inquire at branch locations or by calling (602) 683-1000. This entry was posted in angry members, banks, charts images pictures, comparison spreadsheet, competition, principles, values, listening to members and tagged $3, $5, account, accounts, Arizona, Arizona Federal Credit Union, atm, AZFCU, azfcu.org, card, cash, cash card, checking, checking account, checking accounts, debit, debit card fee, FEDERAL, fee, fees, free, IDProtect, no fee, no fee checking, totally free checking. Bookmark the permalink. 2 Responses to Arizona Federal Credit Union checking account vs other banks and credit unions. Dont let AZFCU rip you off! The credit union can do what it wants. Shut up! No, the credit union belongs to the members. It doesn’t exist to enrich management. The execs shouldn’t be treating this as their personal piggy bank.